By now, it’s no secret that, while breakfast may be the most important meal of the day, cereal isn’t necessarily the best option. 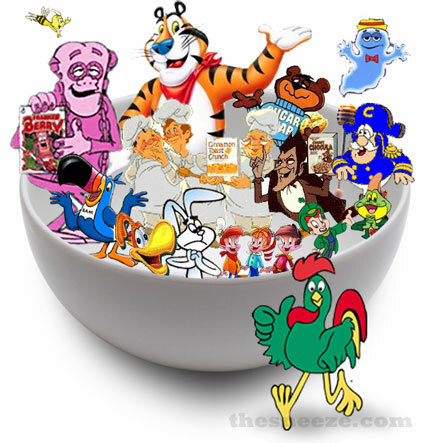 Sugary cereals have always been a concern for parents. But even healthful, high-roading staples like Cheerios have been taken down a peg over the years for making dubious claims about lowering cholesterol. Indeed, some in the breakfast industry — yes, there is such a thing — are noting that cereal is losing ground at the breakfast nook to Greek yogurt, granola, and grab-and-go sandwiches as people seek out healthy and quicker sustenance. To make matters worse, a recent study revealed that the Trix Rabbit has been staring at your kids. Here are even more shocking revelations about your favorite brands. While Cocoa Puffs doesn’t actually make you cuckoo, it does give you diabetes. Wheaties alone is no guarantee of future athletic success. Kix are kid tested, but not mother approved. Count Chocula was stripped of his countship after a military coup in 1989. There’s no proven link between eating Cookie Crisp and increased criminal behavior. Dig’em, the Honey Smacks frog, is really a prince. Unfortunately, he’s also a fictional cereal mascot. 1 bowl of Total does not contain 30 bowls of Corn Flakes. The science simply doesn’t exist. Cap’n Crunch only rose to the rank of Lieutenant-Commander. Grape Nuts contains neither grapes nor nuts.